By Abi - Argentina - 22 Feb/03 - Viewed 1570 times. We spent most of the day Friday walking around and checking out the city. We came across the Casa Rosada, Pink House, where el Presidente lives. It is a beautiful building. As we got closer to the house, in front of it in the park was a huge group of people doing a demonstration of some sort. Police where everywhere, complete with those plastic faceguards they use when them mean serious business. We tried to bypass it as best we could, since all of our guidebooks say to stay away from any sort of demonstrations. We don�t want to find ourselves in the Argentinean jail. Later we found out that they have been meeting every Thursday afternoon for years in protest of the Dirty War. We took a tour of the Colon Theater. It was complete with a behind the scenes tour where we saw the people practicing, as well as the workshops where they were sewing costumes, making masks, and the cobblers, who make the shoes for the performances. The building itself was gorgeous, but we could only take pictures of a certain portion of it. In the auditorium, there is a huge chandelier, where the dome portion can drop down. Then in the top of it, there is enough room for 15-25 musicians to play, to make the music sound like it is coming from heaven, be the voice of God, angels, or whatever. It was fascinating. We met a girl from England and learned that she was traveling on her own. I admired her for that, but don�t think I would want to be a woman on my own in South America. Here in Buenos Aires there are many parks that are really beautiful. They have a lot of open space. We found the statue of Jose de San Martin, the liberator of Argentina. We also visited a cemetery that has many famous people buried there, including Eva Peron. While it was free, there was a lady in front asking for donations to help some blind people. She was pretty relentless, so it didn�t seem like we could enter without contributing. Later, I saw plenty of people walking right in, and although it was for a good cause, it seems that people everywhere are asking for something. I probably won�t do that again. The tombs are very elaborate. They make huge buildings where several family members are lain to rest. Most were not in very good shape, with glass broken out, etc., but some were very beautiful. I did get a little freaked out, though, and was ready to leave soon after we arrived. After that we walked to a museum of fine art, where there were several impressionist paintings, my favorite. There were a few of Claude Monet, Degas, Serat and Rousseau. But, it was a very small museum and we were done touring it in about an hour. It was also free, but no one was asking for any kind of donation here. By this time I was exhausted and we had walked a long way. We took a cab back to our hotel, which cost us about $1. I probably won�t be walking anywhere too far if it is that cheap! We learned that they have a 95% literacy rate here. We could not believe how many bookstores there are. There were 4 large ones just in one block. We figure the high literacy rate is because there are so many bookstores that the people just finally succumb and decide they will learn how to read! Everything is very cheap here, which is nice. We have been eating huge meals for about $10 total. These include huge steaks, which are delicious. The internet is also very cheap, costing about .30 for an hour. I took a nap when we returned and Travis relaxed reading a book. At 9:00 we were going to a Tango Show and dinner. We arrived there actually about 8:45 and were the first ones to arrive. We got a good seat and had dinner. We had bought tickets at a discount place, but the only thing included was the show and the actual meal. Drinks, appetizers and dessert were not included. We had the appetizer and drinks, but declined the dessert since we were so full and planned on getting something afterward. People started arriving about 9:30. We forgot to plan for the Latin lag time. I think the last people to arrive came about 10:30. Finally, the show started, well after we had finished dinner. 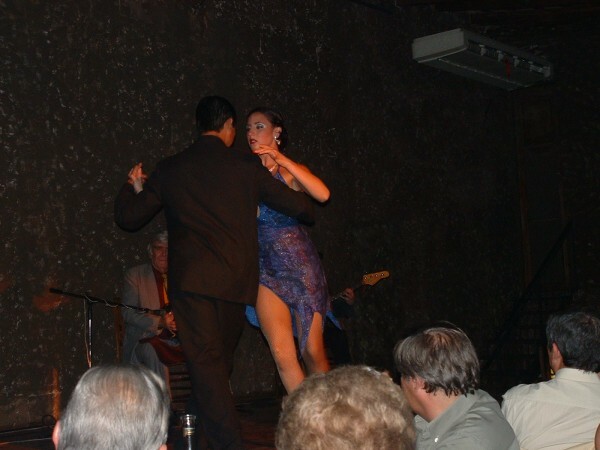 It was very interesting with a piano, accordion and guitar for the accompaniment of the tango dancing. There were two couples who came out several times. In between, there were solo singers, who had the crowd singing most of the time, and the master of ceremonies was a magician. He made a dove appear, pulled paper out of his mouth, and tore up a newspaper and then made it appear whole again. All the people seemed to enjoy it, but Travis thought it was a little cheesy. Perhaps that was because he couldn�t really understand what the guy was saying. I thought he was funny. The show didn�t end until well after midnight. We were too tired to stop for dessert on the way home! We continue to tour Buenos Aires mostly on foot. Travis enjoys just walking around and looking at things, where I would rather have a specific destination in mind and get there. I guess I have to keep reminding myself that I am on vacation, but it is hard to just be wandering around all day with no place in particular to go after touring the museums and important buildings. I plan to start bringing my sketch book with me and when we are hanging out in a park, then I can utilize that time to work on my drawing. I have been too tired in the evenings to do it then, so perhaps that will be a little better for each of us. We discovered an open air mall that had actual stores (not like an open air flea market) that allowed only foot traffic. We walked around there for awhile. I couldn�t believe the prices, but Travis didn�t want to buy anything that we�ll have to lug around for the next 6 months, so we refrained from purchasing anything. He mentioned that we were close to a place a lady yesterday had recommended to us to eat which was near the waterfront. We walked the few blocks there and discovered we were just in time to have the road being moved out of the way for the sailboats to come into port. That took a little while, but was fun to watch. When we got to the other side, it did not appear that there were any restaurants and I suggested we turn around and go back. But, there was something similar to a boardwalk and Travis suggested we walk down that to see what there was. We discovered that there was absolutely nothing. I was really tired of walking by this time, but there were no taxis in sight. At least we didn�t have our packs on! I was trying to maintain a good face, but my feet were killing me with every step. I guess this is the practice I�m getting in that I should have done back in the States. Travis admitted that we were lost and suggested that he had to make one mistake during the trip. He was just glad he had gotten it out of the way so early! Finally we made it back to civilization, got something to eat and then went to another show. This time it was called Smoke and it was of dancers during different time periods. It was very interesting. At the end, 2 of the guys did a stand up routine, which was difficult to understand since they were talking over each other so much. They asked the audience where people were from and we said the States. They made some crack about Bush that I didn�t really understand. I did figure out that they were making fun of many Argentinean political figures and celebrities. After arriving back at the hotel, we dropped into bed about 12:30.